Yemen's Shia Houthi rebels have made more gains in the city of Aden, despite air strikes by a Saudi-led coalition. 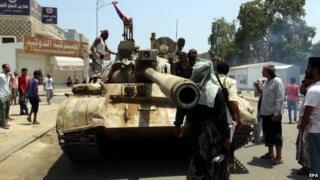 Fighting in the southern city has intensified as rebels and forces loyal to President Abdrabbuh Mansour Hadi battle for control. Countries including China have stepped up efforts to evacuate their citizens amid the worsening humanitarian crisis. The Red Cross has been given permission by the coalition to bring aid into Yemen by plane. It says that two planes have been approved by the coalition. One will be a cargo plane carrying vital medical supplies, and the second a small passenger plane with aid workers. Spokeswoman Sitara Jabeen said that the aim is to fly them both into the capital Sanaa on Monday. On Saturday, the Red Cross called for a 24-hour ceasefire in Aden, the country's second city, warning that more civilians would die otherwise. Spokesperson Marie Claire Feghali told the BBC that the humanitarian situation in the city was "dire" and that bodies were beginning to pile up on the streets. "People cannot go out to buy food, we know that there is a lack of water in the city because the water pipes have been damaged, we are trying to do everything we can but the situation is extremely difficult," she said. On Sunday, the rebels advanced further into the city, bombarding residential areas and setting fire to several buildings, AFP reports. Many residents have become trapped in their homes because of the fighting. Rozmin McKendry from the UK, who has family in Aden, said that her brother could see fighting and shooting from his window. "They want to get a boat to Djibouti and fly back to the UK, but the streets are too dangerous to travel on," she said. At least 185 people have been killed and 1,282 injured in Aden since 26 March, health department director Al-Kheder Lassouar said. The toll does not include rebel casualties or victims of air raids, he added. The UN says 500 have been killed over the past two weeks. On Sunday, a Pakistani aircraft rescued 170 people from Sanaa. More than 800 Pakistani citizens have already left the country. Flights from China, Egypt, Sudan and Djibouti are also scheduled, according to the Saudi-led coalition. An Algerian aircraft rescued 160 of its citizens along with other north Africans on Saturday. Russia, India and Indonesia are among other countries to have already carried out evacuations amid increasing international concern. The Houthis have said their aim is to replace President Hadi's government, which they accuse of being corrupt. They are supported by troops loyal to the former president Ali Abdullah Saleh, who was ousted in the Arab Spring protests. Saudi Arabia says the Houthis have military backing from regional rival Iran, which denies the allegation. Yemen: who is fighting whom? Al-Qaeda in the Arabian Peninsula: Seen by the US as the most dangerous offshoot of al-Qaeda, AQAP opposes both the Houthis and President Hadi. Yemen crisis: An Iranian-Saudi battleground?